Torchmate is proud to offer ACCUMOVE® 2 technology standard with our Growth Series™ product line. ACCUMOVE 2 benefits from the same technology that goes into our most advanced motion control systems. This advancement features state of the art stepper motor control, which provides for shorter cycle times through increased acceleration and deceleration. Improved motion planning allows fluid movement and a more consistent tip velocity. In addition Torchmate Growth Series now comes standard with our next generation height control. This software integration simplifies configuring the height control allowing for quicker setup, and easier trouble shooting. The most noticeable improvement to the Torchmate driver software is Visual Machine Designer (VMD). This modern, touch friendly software program interfacing with the ACCUMOVE 2 control system now include a basic shape library to get your Torchmate Growth Series cutting as quick as possible. Please visit the additional tabs on this page for details and video on ACCUMOVE 2. ACCUMOVE 2 is the proprietary CNC controller designed specifically for the Torchmate® Growth Series™. The software within this controller uses motion control technology developed by Lincoln Electric® engineers collaborating all over the globe. 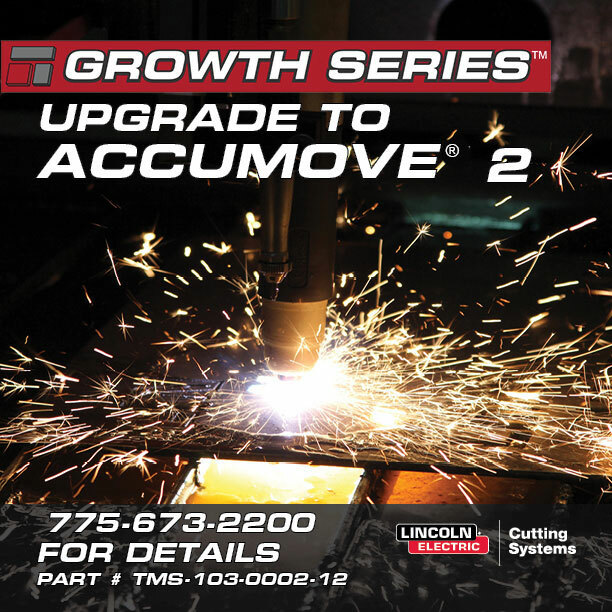 ACCUMOVE 2 has replaced the third-party components formerly used by the Torchmate Growth Series product line, ensuring complete support by Lincoln Electric. Because of Lincoln Electric’s deep commitment to automation, ACCUMOVE 2 benefits from product features passed down from our most advanced motion control systems; something no competitor can offer. Our in-house manufacturing not only gives us an advantage in innovation, but also allows us to pass our manufacturing savings to you. What is Visual Machine Designer? Multi-tasking allows you to create and prepare new jobs while the machine is cutting. The shape library consists of 28 commonly used shapes built into the software, eliminating the need to design them in CAD. Array creation allows ACCUMOVE 2 to duplicate parts without modifying the CAD file. Job queue prioritizes and sequences multiple jobs with forward-looking automation. The plate alignment feature saves time and reduces scrap. ACCUMOVE 2 registers the corners of the material through a torch touch, and realigns the design to match the metal being cut. Is digital height control a standard feature? Yes, ACCUMOVE 2 features our next generation integrated digital height control. With this new design, produced by Lincoln Electric, height control technology jumps to a new level. Its new Dynamic Cornering™ anticipates and prevents torch dive in corners and handles material irregularities, making “Corner Lockout” obsolete. Ohmic sensing enables true-zero height programming, which results in optimized piercing, fewer touch-offs, and faster completion times. Integrated height control simplifies configuration and troubleshooting, and makes operation more efficient. Do you still use stepper motors? Yes. ACCUMOVE 2’s stepper motor controller is on the forefront of technology. It provides shorter cycle times through rapid acceleration and deceleration, reduces energy consumption, and extends consumable life by accurately placing pierce points. The smoother operation reduces machine vibration, which results in decreased maintenance costs, as well as quieter movements. Dynamic Cornering is an advanced algorithm that controls torch height in corners and curves. Many older systems used “Corner Lockout” to disable the height control along curved cut paths to prevent torch dive. Dynamic Cornering keeps height control active—not disabled—and compensates for warped material and complex curves. Various Lincoln Electric research and development teams from around the world developed ACCUMOVE 2. The development process began shortly after Lincoln Electric acquired Torchmate in 2011. Will ACCUMOVE 2 work on my Torchmate 1, 2, 3, or X Table? No, Lincoln Electric developed the ACCUMOVE 2 specifically for use on the Torchmate Growth Series. ACCUMOVE 3 is currently available for our mid-line tables. For our most advanced systems, we offer the Burny® Phantom II controller. Can I upgrade my older model Torchmate Growth Series machine? In most cases, you can. Torchmate parts sales can provide you with a complete upgrade kit for most plasma cutters. ACCUMOVE 2 requires ohmic sensing to function, and a few cutter models cannot be fitted with an ohmic cap; so be sure to call our Parts Department (775- 673- 2200) to verify your plasma cutter’s upgradability. Will I see improved cut quality with ACCUMOVE 2? Yes, ACCUMOVE 2 increases cut quality and performance through Dynamic Cornering. Ohmic sensing accurately sets the zero-point datum for your height control. ACCUMOVE 2 electronically senses the completed circuit when the torch cap touches the metal. This method sets the zero height precisely compared with the older torque-sensing techniques. By over torqueing the motor to estimate the zero point, the pressure can flex the material, causing inaccuracies. Ohmic sensing avoids flexing and additional motor stresses with a zero-pressure contact point. If my older Torchmate CNC controller or AVHC needs parts, must I upgrade to ACCUMOVE 2? Not immediately, although the ACCUMOVE 2 upgrade kit provides an attractive path to upgrade, and is backward compatible with all Torchmate Growth Series machines. Upon expiration of your older machine’s warranty, any replacement parts will be limited to available stock on hand. We will always do our best to support our customers.